We are a trusted automotive body shop that specializes in auto body and mechanical repairs, detailing, paint correction and more located in the heart of downtown Belle Chasse, LA. Looking for the best auto body shop New Orleans / Belle Chasse has to offer? Look no further! Big Easy Collision is your one stop shop to handle your auto body repairs, paint jobs, Ceramic Pro paint protection, detailing and more. If you’ve been involved in an accident, need mechanical repairs, auto detailing and more, we can take care of you. Our technicians are experts when it comes to auto body repair and auto detailing. At Big Easy Collision we take pride in delivering the best quality. We’re committed to auto repair and to serving you with honesty, quality, and value. If you need auto body work, car detailing or mechanical repairs than you’ve come to the right place. Our mechanics are experts and will treat you with respect providing you with the best service Belle Chasse / New Orleans has to offer. In terms of finding an auto body shop New Orleans / Belle Chasse, Big Easy Collision will take care of all your auto body repair needs. Come see us now in Belle Chasse, Louisiana! Get a Free Quote here. Your time is precious. We will come to your home or work and pick up your vehicle. When the work is complete we can also deliver it to you. The right collision repair ensures the safety of any car or truck. We bring advanced techniques and cutting-edge diagnostics to the table every time. Contact us for an incredible auto detailing experience with Big Easy Collision! Our friendly, experienced collision repair technicians will keep your vehicle in top condition. We use the latest diagnostic and repair technology to provide high-quality service and quick turnaround. We use only OEM recommended repair procedures through ALLDATA Collision connect. It’s another one of our many tools to ensure that your car is repaired properly. From collision repair to detailing, we’ve got you covered. We know what we’re doing, and we’re dedicated to keeping you safe on the road. Your satisfaction is our highest priority! Looking for best auto body shop New Orleans / Belle Chasse has to offer? We offer high quality body repairs utilizing OEM repair procedures to ensure that your vehicle is repaired in the safest manner possible. Most new vehicles on the road today were painted with WATERBORNE PAINT at the factory. We are one of only a handful of shops in our area that are utilizing this eco-friendly refinish process. This also allows us to provide you with a factory color match. CHIEF Automotive Technologies has been the market leader in Collision Repair Equipment since 1972. We proudly use Chief EZ Liner frame straightening equipment to return your vehicles structure back to factory specifications. Don’t trust your vehicle’s lifeline to an “under” qualified technician. Our ASE certified mechanics can replace your vehicle’s collision damaged parts properly using ALLDATA OEM collision repair procedures. Are you looking for the highest quality auto detail center Belle Chasse has to offer? Then you’ve come to the right place. 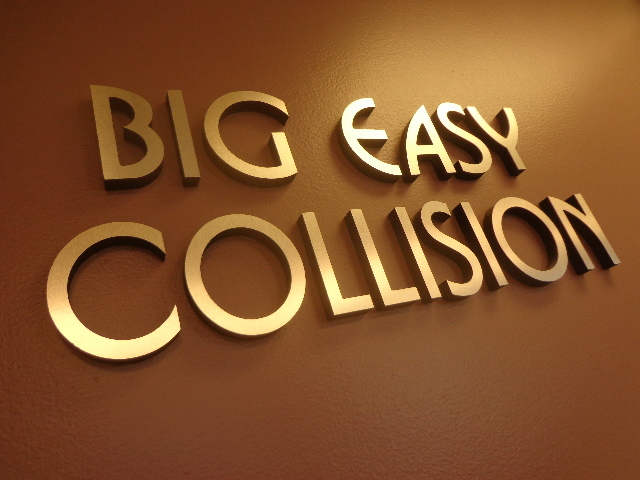 At Big Easy Collision, we want to take care of you and make sure you drive away feeling as good as your car looks. Let our expert technicians take care of your vehicle making it shine. We have auto detailing packages for everyone so why not give our vehicle a little TLC while it is being serviced. From overspray and fallout removal to upholstery extraction we provide it all. Don’t risk damaging your vehicle’s protective clear coat. Let our professional detailers give your vehicle’s finish the expert care it deserves. Come see us today for best quality auto detail center Belle Chasse has!